I once heard a saying goes like this, "Accessories are what separate us from the animals." 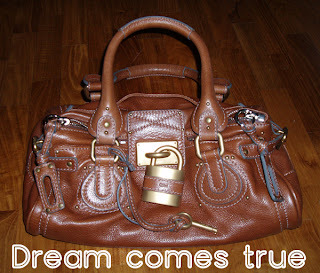 In fact, in Singapore, designer handbags are what differentiate us from -- no one. Everyone seems to be lugging some sort of designer bags down the street of Orchard Road, of course, giving them the benefits of doubt that they are AUTHENTIC. Walking down Orchard Road, I’ll see jeans-clad women of all ages carrying the latest ‘Neverfull’, classic ‘Speedy’ from Louis Vuitton, the zero-value Gucci (since they have sales yearly), and for-aunties-only Coach -- and we're not talking knockoffs. Price tags of $800 to well over $1,000 don't seem to faze even the youngest bag-crazed fan. Me? I always have a soft spot, a super duper soft one for designer handbags. 4. any ‘important’ function is coming, and you have got no bags! ‘Important’ function can be a simple gathering with ex-classmates, or even visiting the vet. Sometimes, it's more likely I'd be looking at someone else’s bag and I thought it really tells me who this person is. The story goes all the way back to about 13 years ago. I remembered I got my first so called designer bag from my Mum; it was the ELLE school bag, the staple brand for all school gals, and which I simply had to have. I was absolutely fascinated. I walked into school lifting my head up. Of course, no one will stop at one designer bag. Eventually my bag closet started to welcome ‘new members’ bi-monthly or every half a year, there were more ELLE then JPG and then famous Sonia Rykiel. 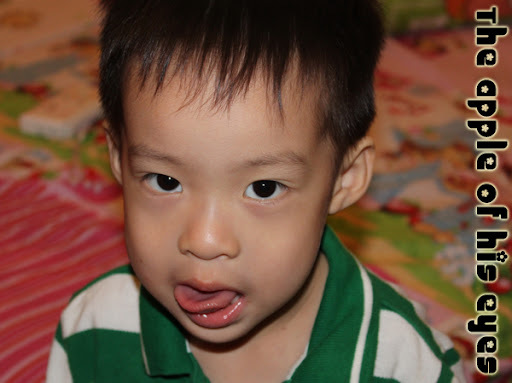 I was so infatuated that I almost wanted to alter my name to Rykiel Wong (how cool?). Of course when I came out to work, naturally that would mean more spending power. I started teaching tuitions since secondary school days and I bought my first LV sling bag during poly year 1. I swear I was possessed by some LV genies. But hey, LV bags actually appreciate after so many years, at least this assured me that spending on LVs are not sheer waste of extravagant splurging. 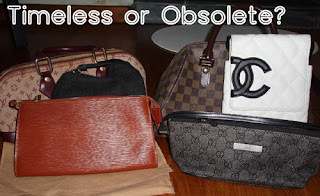 A decade of frivolity of shopping, resulted in one LV after another, about 5 Gucci bags (some of which are thrown away cause they are beyond ‘cleaning’), a Chanel Cambon, a Burberry’s etc. Recently, the obsession got out of control again. Bags of hundred over bucks did not satisfy me any more. I started looking at bags that falls into the thousands categories. Gucci (for my part time degree), Fendi Mini Spy (for work), LV Speedy (cheaper alternative for daily work), Prada (for lugging Ziv’s stuff) and Chloe Paddington (to fulfill my dream of having one). I can have a bad hair day, a fat day, or just a sad day but I can never go wrong with the perfect bag and I can never have too many. 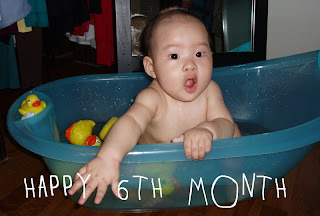 Ziv is going to be 6 mth old this 19th. 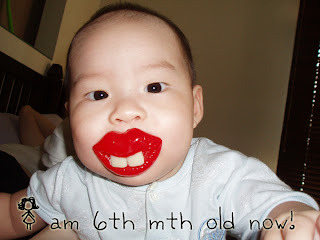 Well, it does not pay to be a nice boy, cause, Mommy decided to make fun of him. 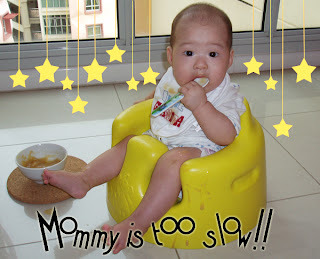 Ziv is turning 6-month soon, which also means new formula milk for him and solid food will be included in his daily diet. 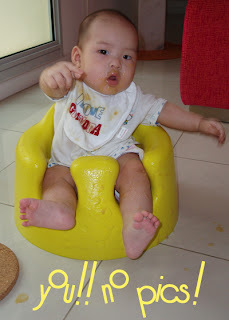 Before reaching the 6th month, I noticed his ‘liking’ for food. It becomes very obvious especially during our dinner time. 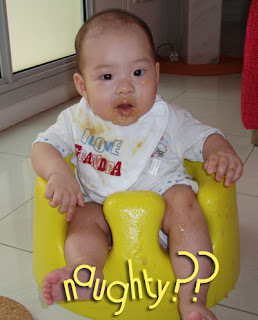 He will sit in his walker, linger around the dinning table, and peek at our food, his eyes seems to convey, “Food… Food… I want food!” Either he has realized that other food do exist other than milk or he mastered the ‘pleading look’ from the originator Coby. Anyway, he won, just like Coby. 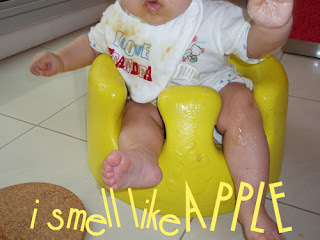 We gave in to his ‘request’ by giving him organic apple-pear puree. Conclusion? See for yourself. 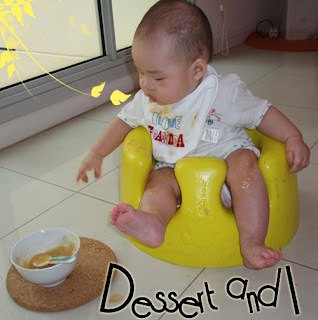 Ziv enjoyed his dessert very much, and Kevin and I enjoyed taking pictures and videos of him making a mess. Ziv could actually finished the entire apple-pear puree (yogurt mini tub size) but I deemed that it was too much for him, hence the leftover went to Coby. Of course, after the mess, I decided to bath him again. Went to Hanabi Bt Timah for a delectable meal this afternoon. Have to admit, I have got a real soft spot for Japanese cuisine and therefore I suggested having Japanese ala cart buffet. The sashimi mix platter really hit the spot, made me feel so satisfied even past dinner time. Food aside, Kevin and I have got great company for this New Year lunch, Dylan and Emily. 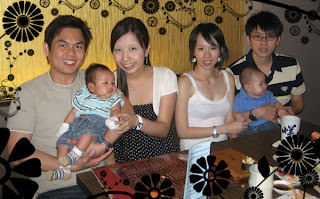 Still remembered when we dined at Shangri La The Line exactly a year ago, I was the only one pregnant, and this year, Emily and I are mommys now. I call this meal, 'the new parents lunch'. Last year, our conversation revolved around every other things under the sun except childminding. And today, all of us talked like professional mommys and daddys. Imagine, next year's New Year lunch/dinner, the boys will be running around the tables with mommys and daddys busy catching them. I think that is fun. It's hard to get the boys to look at the camera. Not to mention the daddys, standing in front of them making funny noises. I was smiling cause I thought I saw monkey daddy Kevin shaking that piece of white paper to get Ziv's attention.